Our product range includes a wide range of belt conveyors, screw conveyor, magnetic chip conveyor, vibratory conveyor and magnetic belt conveyor. Belt Conveyors is a mechanical handling equipment used to convey bulk material from one place to another. They are a very popular conveyor system that it is known even to people outside the manufacturing field. 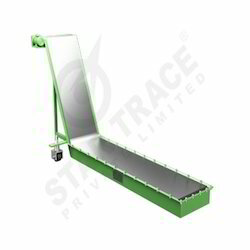 We at Star Trace have been dealing with belt conveyor for the past twenty years and have supplied to customers globally. Basically heavy and big boxes, sacs or materials are moved in the Belt Conveyor. The speed of the belt is controllable by a control unit and can be regulated depending upon the product conveyed and the desired output. The Belt Conveyor has the greatest advantage of saving time and labor. Robust built up to work effectively in challenging environments. Spillage is reduced by incorporating finishes like skirting. The straight forward running of Belt Conveyor needs no explanation, once the system is powered the rollers start rotating and work begins. The velocity at which conveying is done differs widely according to the kind of business and product handled. The construction of the Belt Conveyor is simple and do not have complicatedly functioning parts to manage. So they seldom create problems and offer a trouble free dynamic environment.The Belt Conveyor has rollers beneath the belt, which are the driving forces for movement. The acceleration at which the rollers rolls determines the speed of conveying.They are present all along the length of the Belt Conveyor.Control units are installed to regulate the rate of flow. The Belt Conveyor is an industrial equipment which is used for moving the mined ores from one place to the other. Coal, fly ash, aggregates, stone, gravel, sand etc are few of the many substances moved in the Belt Conveyor. Star Trace as a leading manufacturer, Supplier and exporter of all industrial equipment has designed the competent Screw Conveyor which is used across many industries for handling a wide variety of materials. Screw conveyor handles bulk goods from one process level to the other usually along a plane surface ,slight inclination can also be given to deliver at a higher position. The extensive use of screw conveyors is due to the low maintenance,uniform movement of large quantities and even distribution to the next stage. Variations in design are also done to suite the kind of stuff handled. The screw conveyor is made of high tinsel strength alloy which can withstand aberrations cased during operation. Capable of conveying loads in flat and inclined positions. Discharging at multiple outlets is also possible. Works without or with very less down time. 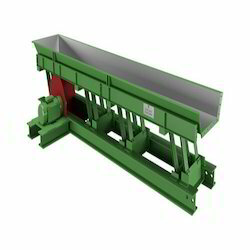 The screw conveyor has helical screw blade that rotates and is placed inside a trough which is in semi circular. The rotational motion is initiated by a motor and keeps the screw in a fixed motion. A lid is also provided to close the screw conveyor to prevent external contamination or spilling down. Once the driving force is engaged in the operation the screw conveyor starts rotating. Input can either be fed directly into trench or the screw conveyor may take up material from storage tanks or feeders below which it is placed.As the screw revolves they keep pushing the feed forward and finally discharge them to the next processing phase or to where ever they are scheduled. Thus with simple functioning the screw conveyor moves supply forward to the desired location. 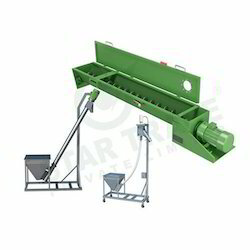 The screw conveyor is capable of moving substances that are fine powder, granules, wet and semi solid. The products that come under this category are food waste, garbage,animal feeds,ash, grains etc. Possessing strong engineering background and two decades of experience as manufacturer, supplier and exporter we design A-Z of magnetic equipment. The Magnetic Chip Conveyor is one among them and has had wide spread use in many industries. We have designed the Magnetic Chip Conveyor in accordance with the growing requirements that are in demand. The Magnetic Chip Conveyor is a simple conveying system that uses chip magnetic magnets to transport small iron chips or even finished small sized ferrous materials to the collection box. Manufacturing Custom made equipment is a way of life as we very well understand that one product does not suite the need of all which is true to chip magnetic conveyor as well. Can be configured wherever necessary as it does not occupy lot of space. It can also be incorporated into an existing set up without much modification. As there are no belts wear and tare replacement is not needed. The Magnetic Chip Conveyor can virtually carry any ferrous chips that are hot, cold, dry, wet or oily. The Magnetic Chip Conveyor with chip magnetic is commonly seen in CNC turning centres where small parts manufactured have to be taken by conveyor to collect in delivery spots. Other places include CNC machining units multi-spindle automates, press shops and heat treatment furnaces. Conveying is a very common sight seen in all industries, right from procurement to dispatch a lot of carying action has to be done to gear up production. Proper transporting mechanism to carefully handle the product is necessary.The Vibratory Conveyor is one such equipment that transfers raw materials from one place to another without damaging and spilling the contents. It has an edge over other conventional conveyor methods. Star Trace offers Vibratory Conveyors in different specifications which sets them apart from the others in quality, durability, efficiency, cost and service. Constructed using heavy duty metal to resist insults of any extent. Vibrations are not transmitted from the conveyor to the other parts as they have an isolated set up. The conveyors are made of stainless steel or can be fabricated as requested by client. The drive does not require much electricity and so power consumption is less. The design of the conveyor is such that it can be easily washed and maintained in high sanitary standards when employed in food handling industries. With variations in design the Vibratory Conveyor is used across several production units for the purpose of conveying. When the motor is switched on the vibratory action begins in the Vibratory Conveyor and the materials present in the conveyor are moved forward. The speed and intensity with which the items travel is determined by the settings of the vibratory motor. While in the transition phase several other activities like drying, scalping, dewatering, grading etc. can also take place. When the Vibratory Conveyor are used in mining industry only a rugged built-up can with stand the abrasions caused by the ores and rocks. The Vibratory Conveyor as such is a stand alone equipment that consist of the conveyor pan mounted on an isolated frame. Vibratory motors numbering one or two is positioned to produce vibration. The length and breath of the conveyor can be modified according to requirement. The vibratory motor can be tuned to increasing or decreasing the intensity and speed of vibration. The floor space they occupy depends on the dimension of the trough and other specification else they do not occupy much floor space. 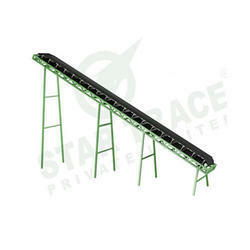 Star Trace manufacturers Magnetic Belt Conveyor which are used to convey small iron parts to collection pits. The Magnetic Belt Conveyor ensures safe movement of tiny parts which would have otherwise has chances of being missed owing to their size. Seasoned manufacturer with over 25 yrs of experience in manufacturing magnetic equipment, the Magnetic Belt Conveyor which is yet another addition. The Magnetic Belt Conveyor needs minor changes in an existing set up to be incorporated in the process flow. A series of magnets are arranged beneath the conveyor that carries ferrous particles to the destined location. The Magnetic Belt Conveyor is used by clients globally as we adhere to standards. Thought preset dimensions are available, off beat specifications are also delivered on sales request. Manufacturers, suppliers and exporters can expect on time delivery of the orders placed. Putting the magnetic property to use the Magnetic Belt Conveyor has a conveyor which is capable of forward movement with the help of motor. Fixed below the conveyor are a series of magnets that keep the conveyed iron substance in place by exerting its magnetic field. 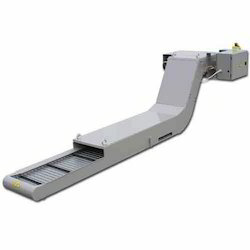 The Magnetic Belt Conveyor is also capable of carrying substances in an inclined plain and subsequently disposing them at the collection point.